One weekend, we subscribed to KBO that is Kapimlya Box Office, for you. There was one movie that got my attention and that is Everything About Her. 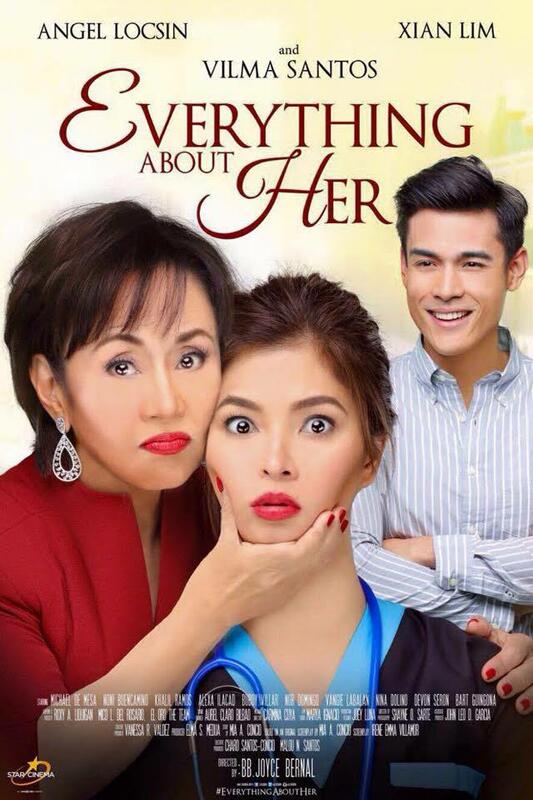 After watching this award-winning two hour long comedy-drama film starring the Star for All Seasons, Vilma Santos, Angel Locsin and Xian Lim , my eyes are still puffy from the crying I did. Despite all the tears I shed, every single emotion created by this movie was truly valuable. I wasn’t surprised when it gained box office status and all the local and international awards. The film, I think was inspired by The Devil Wears Prada, starring Meryl Streep/ Anne Hathaway that is about a diabolical fashion editor and her new assistant. But despite the laughs, I sensed there seemed to be something deeper beneath the surface that is waiting to be unveiled. The story line centers on Vivian S. Rabaya the CEO of a top real estate development company, Optima Land. She is known as a tough multi-tasking lady, a no nonsense type of persona and one who is used to see fast results. Although she is on top of her game, she is a failure as a mother and her family life, well yes, stinks. She is estranged from her only architect-son Albert R. Mitra (Xian Lim) and separated from the husband who could no longer keep up with her as she built her business empire. Jaica who comes as highly recommended best nurse in her hospital who is really hard-working and financially struggling in order to provide for her family. When Vivian is diagnosed with cancer, she hires Jaica to be her full time nurse. While not used to being helpless, and being treated like a moron, the two glacial conflicting characters battle it out and learn from each other as they run together to defeat Vivian’s disease. I find the beginning very light, with witty one liners, funny discourse and banter — Angel as Jaica Domingo was charming and funny because her movements all seemed natural. Vilma’s Vivian proved a thwart for her character because it was a role so unusual for her after all many her years in the entertainment industry. She was 100 percent certified beast mode. A single scowl seemed enough to erupt through the walls! But viewers should not have been hushed into thinking that this was going to be the tone of the whole film. It was just a draw, after all to lure everyone into thinking that it will be a typical optimistic poor girl wins the heart of her nasty boss. I observed the hidden layers to their characters. There were spurs for their actions and as their own stories reveal before the silver screen, audiences feel more associated to them. The characters become instrumental to one other in finding peace and forgiveness. I feel that there’s just something wonderful in that. Right from the beginning, the movie showcases the success, power, and character of Dr. Vivian Rabaya, a tough, strong-willed woman who runs her company like a slave-driver. She goes around with six-member-entourage with one carrying an umbrella above her head. Dr. Vivian S. Rabaya, a Doctor of Humanities, is portrayed as a courageous woman who pukes threats when her orders are not immediately carried out. She hates lack of common sense in her staff, she does not want to repeat herself and she wants everyone to get up and move when she gives her marching orders. As the film opens, Dr. Vivian is in a speaking engagement. She is introduced as an orphan whose childhood dream is to have a home to call her own. That gives the viewers a preview of her past. Another scene also shows that she is compassionate to street children. She talks to them in a soft and kind manner, the exact opposite of the way she treats her staff at work. But as destiny would have it, the successful, strong, and powerful CEO is hit with cancer of the bone marrow. She barely has 29 months to live. I commend Direk/Bb. Joyce Bernal for the superb direction of this film. Even if a movie already had a powerhouse cast of actors going for it, Bb. Joyce deserves credit for squeezing out the best performance from each one. Vilma Santos is truly a master in her craft —no objection to this. Although, “Everything About Her” stubbornly trips over narrative imperfections and editing blemishes, Bernal’s untried attempts being tangibly evident, and while that doesn’t condense an ample portion of the totality senseless, it still gets me to think how everything would have turned out, if she had focused cultivating the depth and scope of her material. My favorite scenes in the movie were actually the quieter moments when she longingly looked at her son as he slept, her uncalled-for hug for Angel’s character to thank her for her compassion, but the best scene, perhaps not just for Vivian, but for all three lead characters — was the bathroom scene when she finds out that her son knows about her disease despite her wishes! It does not come as a surprise how Santos, a left-hander like myself, pulled off Vivian with undisputable credibility. She gives her character and its layers with intense vigor, credibility, and creativity that probably only someone with her caliber and stature could ever do. On her character’s most heartbreaking moments, she dispenses exactly what a woman faced with the fury of death, while also fighting to reach out for a son she might probably don’t have enough time to spend together with, would feel and look like, a performance she delivered with aplomb. I was impressed with Angel’s portrayal of Jaica the smart, confident private nurse who does not seem to take life seriously. She did the orthodox female lead role in a technique that is not saccharine. Instead, she added depth to her character with small gradations, eye movement, smiles and actions that make her outstanding, and more human. She has an equally impressive ploy of Jaica, who on most occasions, is presented as the film’s comic effort, acting as one of the narrative’s heart and its beacon of hope. In short, the glue that holds mother and son together. The character is commendably pulled by Locsin with her irresistible charm and affection, a capacity she maintains even on the character’s very own moments of breakdown. One thing that bothered me is the elevator scene. I always thought that mobile phones do not work well in elevators. Honestly, many movies and TV shows have worked their conflicts based on the fact that there is no cell phone signal on lifts. But the scene has Jaica talking on her phone without any trouble at all while she is inside it. It is then such a comic relief when she talks about a seemingly very serious matter without the smallest amount on her cheery disposition. I know the scene needs people to hear out her conversation but it could have happened at least in an escalator or in a hallway and the effect would still be the same. But anyway, Bb. Joyce must know something better than we do so it has to be inside the elevator. Also, I am not sure but I thought nurses should not have their hair fall on their faces but Jaica’s hair is all over her face even as she helps revive a patient. The movie’s plot is predictable, I should say. Otherwise, it won’t be a Pinoy movie! So we have a an ailing mogul and a nurse, then all we have to do is wait for their paths to cross. Dr. Vivian wants a private nurse and her doctor (Bart Guingona) puts in a good word for one of the best nurses in the hospital. The scene shows more of Vivian’s character when she did not want “one of the best” but the “best” nurse in the hospital. As is her tendency, she looks down on Jaica even at their first meeting. “How did you place in the nursing board exam?” she asks without even looking at Jaica. From Jaica’s file, Vivian has seen 2 cases of insubordination but she also finds a rating of 10/10 from patients and their family members so she gives her a chance. Jaica is asked to sign a non-disclosure agreement because Vivian does not want anyone to know of her illness. Vivian warns to sue Jaica and swears Jaica would lose her nursing license if she breaches the non-disclosure agreement..
With the huge amount promised her, Jaica agrees to PDN and to provide nursing care to Vivian 24/7. To justify her presence at work, Vivian introduces Jaica as her Personal Assistant. Thus, begins Jaica’s ordeal with a very difficult patient. Jaica is also struggling in her relationship with her mother who has left them to work overseas and has not come home for ten years but Jaica did her best to help her patient be reconciled with her son. It angers Vivian when she has realized that Albert knows about her cancer and it almost cost Jaica her job. While I am not exactly a big fan of Xian Lim, aside from the fact that he is also left-handed like me, I must admit that I should credit him for stepping up his acting game for this film. In previous movies that I saw with him in it, I felt like he vexed too much about how he would convey himself on screen. After seeing Everything About Her, I felt that he wanted to give his best performance more than he wanted to look dapper and I must say, it paid off in the end. His breakdown scene was raw and heartfelt, and came out as very genuine. This is probably his strongest performance as of yet, having gotten across with the necessary power required by his character, whose wounds and struggles are equally as deep and excruciating as his mother’s. One more thing that is very noteworthy, is the amazing chemistry his character forms with Locsin’s, adding another layer of peculiarly crippling charm to an already gripping story. He comes forward here with an inexperienced but resounding flexibility. With the thought of dying, Vivian decides to build low-cost housing for her company’s employees and laborers, which becomes her biggest and enduring legacy. Enter her US-based architect son who does not want to have anything to do with his mother. Jaica decides to tell Albert about his mother’s cancer but begs him not to tell his mother that he knows. He comes home but the relationship between mother and son is cold. When Jaica and Vivian talk in the garden about motherhood, Jaica obviously speaks of her own mother while Vivian talks about herself but each of them represents their generation. Well, needless to say, Vivian has changed. Her callous heart becomes tender and kindhearted even to her staff. And her relationship with her son Albert further improves as Albert himself has found out he did not want his mother to die even as he hated her for choosing her job, career, and company over him and his father many years ago. I loved the well-written script and the headway of the story. The pressure seemed to increase progressively but when it came to the dramatic part, it came in wave after wave of emotion. The feels in this movie was just so overpowering and prodigious in a good way. Thirty minutes of laughter and a subsequent hour and a half of non-stop crying seems like a fitting fraction for this film based on my ballpark figure. At its core, “Everything About Her”, is a family drama that speaks for sentiments that aren’t necessarily new. Most audience would not have hard time recalling its relatable set-up, because amidst its familiarity, the film mines a heartrending layer at second chances at love and family, that probably everyone won’t fail to recognize, one that evokes catharsis and self-evaluation. The movie ends well but I would have wanted to know the story behind Jaica and her mother (Sharmaine Centenera-Buencamino). Her mother is an OFW and it seems like she did not forsake them because she has kept her communication with the youngest daughter (Alexa Ilacad). Why she did not come home for a decade, the movie did not say so. Did her parents separate? Were they abandoned financially? In all probability yes, because Jaica is shown to have a mammoth bank debt, which Vivian settled on Jaica’s behalf and gave Jaica’s youngest sister a college scholarship out of generosity and gratitude for attending to her medical needs to which Jaica was grateful for as well. And to cope with their situation with their absentee mother, they have a female brown dog whom they named Nanay who is always out and takes them awhile to find it again but eventually lost it. There is an easily familiar complexity in Star Cinema’s “Everything About Her”, one that isn’t necessarily rational, but one that is debatably, painful. The narrative is rapid to make its focus clear, staying faithful to its title throughout almost its entirety, by sharing almost only everything about Vivian, while also letting other key figures to flawlessly fit in with her story, and thus eventually become a part of who she is. Whereas the film’s proceedings come across as yet another transposition of a familiar film cliché, it strikes a chord by remaining a supporter to a formula, that maybe too predictable at times, but nonetheless works because of its relatability. There is a demonstrative charm in its humor and understated comic attempts, and it massively works when infused on the film’s emotional moments. All in all, I loved the movie because it carried an inspiring message about families and balancing work life with one’s personal and professional as well as spiritual life. It is a story about forgiveness and love and the way it was presented was just splendid. It was an impeccable combination of an excellent story, a genuine warm message, impressive acting and a performance that was on point throughout the whole film. I give it a rating of 4 out of 5 stars.